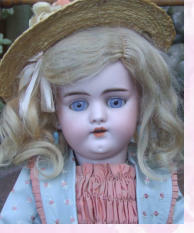 She has a perfect bisque head which has rosy cheeks and is nice quality, open close eyes with both eyelids and quite a few lashes intact, and a replacement real hair wig. She also has nostrils and her mould number is 351. Her body is in excellent condition. The dates around 1920 and measures just over 16 inches.